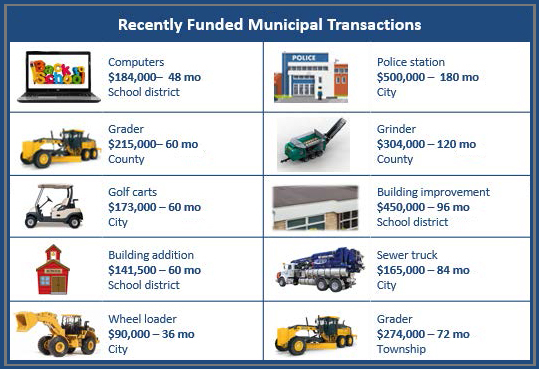 Kinetic Leasing has been contracted by CPC to provide lease financing to the public sector including: county and city municipalities and schools districts. Kinetic Leasing offers equipment and services financing from $5,000 up to $5 million. There is a no-cash-down option with 100% of the project financing. Established in 2000, Kinetic Leasing is a general equipment financing company with offices in Fargo, North Dakota, Marshall, Minnesota, and West Des Moines, Iowa. We specialize in providing flexible, creative leasing solutions to middle-market businesses and municipalities. For more information, go to www.kineticlease.com.